However, I could do with a little bit of guidance here, so I have a few questions (but you don't need to be an artist to answer them). Please don't go hunting for one, as I do plan on hunting for references myself. It would just be really handy if someone knew off the top of their head "Yes, there is one in Issue X". 3) This one might seem odd, but what Mobian races do people think would translate best for Elves and Dwarves? I'm thinking an Armadillo might be a good Dwarf equivalent, but no idea for elves. And now for the second part of the topic title. Yep, if anyone want me to do a drawing for them, even though my artwork is frankly terrible, I'm willing to give it a go. Especially if you have a member milestone also coming up, I'll try and have it ready for then (though with my work scheduled I can't really promise anything). And I'd rather not do anything that, well, would require a 15/18 age rating. Aside from that, I'm willing to give anything a try, so please just ask. Hmm, maybe I should consider getting a deviantArt account.... and that's something I never thought would ever cross my mind! Is that good enough as a visual cue? 2. ...Well, there's always the Pack, those wolves led by Lupe. 3. ...I always thought Cats would be good elves to be honest. What with their pointed ears and tall slim bodies. Also, I do have a request. If it's at all possible I'd like you to make an image for Lord Metallix of my newest work of Fiction. 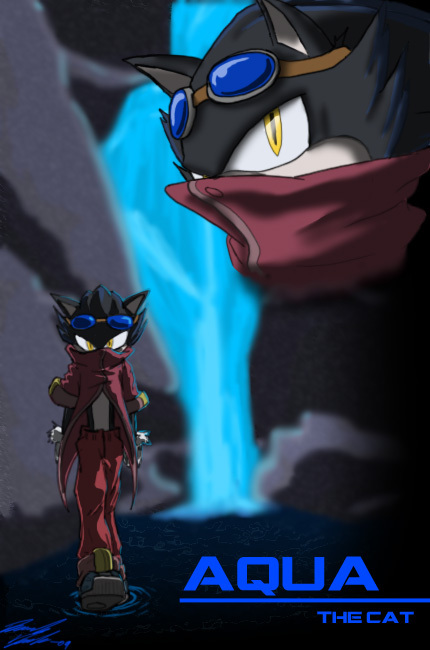 There's not much to his design, it's basically Metal Sonic in a black hood and cape. 1. It's a good starting point Jest, but alas with part of the face being covered it's not a full win! 2. Have they shown up post reboot? 3. Yeah, that's probably right. Hmm, as Lynx's have bigger ears would they fit more? And sure thing, I'll try and fulfill your request. Lupe is still present . 3 ) Lynxes. They are the perfect dwarves. 1) Yep, I'm looking for male cats. Even if they just showed up in the background rather than being an actual character, just as a starting point. 2) I know Lupe should still be around, but we haven't SEEN her yet (I think) and there is a good chance she's been redesigned to fit the new world. I'd like to see what the redesigned wolves look like. 3) I don't need cultures that are close to elves and draws, more Mobians who have a close physical structure. Yes, most Lynx's are short, but they are also nimble, lithe, agile etc, which don't apply to dwarves as a rule! ;) Hence my idea of using Armadillos for dwarves. And thank you very much Dylan. Sorry if this post is closed, but I was curious about the wolf pack since I saw something in the wiki regarding them (also i apologize if this is a little off topic). With Leeta and Lyco, is there a chance that they may still come back? The wiki said they disappeared but wasn't sure if it was true since I couldn't find anything that hinted towards this. I was wondering since they were favorite characters that I connect to (I'm also a twin lol). I hope they come back. I feel as though there aren't that many wolves in the series (from what I remember). Thank you and again sorry if this is closed and if it's a little off topic. While this is off topic, I will answer the question. Odd are they will not be coming back, and were lost in the G-wave universe reset also with so many others. The new universe seems to be game characters, main cast from SatAM, and new characters only.